jarvis, originally uploaded by alister. Jarvis Cocker on stage at the Picture House Edinburgh, Friday 28th November. The former pulp frontman and survivor of the ill-named 'brit rock cool britannia' era was the headlining act on the Rough Trade records 30th anniversary tour. I was excited to see Jeffrey Lewis in support. Lewis does a kind of lo-fi Dylan bit and I first discovered him through his excellent cover album of Crass songs. His version of 'Big A Little A' (find it on his myspace) was my soundtrack this week as I waited for news of downsizing at work. The Dylan comparison was emphasized with his cartoon telling of the history of Rough Trade. 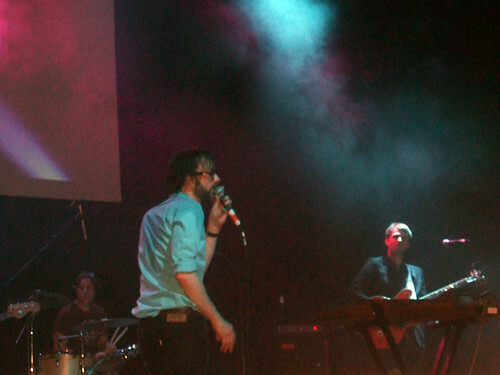 Jarvis is a great lyricist and performer. He had the looks, the moves and the slideshow. We were treated to a hilarious guide to the venue through the ages along with random things spotted on the way to the gig. This was my first visit to the Picture House in its current incarnation. In a previous life it was the Caley Palais and the scene of the first 'proper' gig I ever attended - an acoustic era Everything But the Girl back in '85 if you must know. I hope they can continue to attract big names and stay afloat in these tough times.